Do names like Trello, Zapier, and Balsamiq make you feel like you’re reading the street signs in a foreign country? Then let Digital Marketing Technology Stack: 25 tools to get you started in digital marketing bring you up to speed in the world of “MarTech.” And help you craft a stellar marketing calendar to keep you on track. The marriage of marketing and technology, or MarTech, is here to stay, and this eBook is your guide to staying current. Use these 25 tools to get your marketing strategy back on track, collaborate more effectively, and finish projects ahead of schedule. Don’t be the last marketing VP to hear about the latest SEO and CRM tools. Or the ad agency intern mindlessly scrolling through Pinterest for hours everyday. 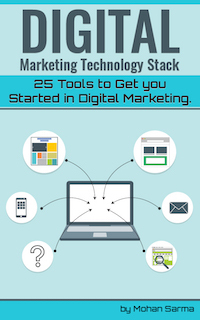 Get this eBook today, and get on your way to becoming a MarTech Guru.